In a surface-to-surface mission the high power acquisition radar (HIPAR), the auxiliary acquisition radar (AAR), and the low power acquisition radar (LOPAR) transmit pulsed RF energy from a continuously rotating, highly directional antenna. An object in the path of the transmitted RF energy reflects a portion of the energy back to the antenna. The acquisition radar system converts the reflected RF energy into video for display on cathode-ray tube indicators. The radar select curcuit permits selection of either HIPAR/AAR or LOPAR video display. Anti-jam display (AJD) facilities are provided for both the HIPAR/AAR and the LOPAR systems. In the presence of enemy jamming, the AJD allows the target to remain visible on the cathode-ray tube indicators (scopes). An identification friend or foe (IFF) system also is associated with each of the two acquisition radar systems. When IFF identification of an unidentified object is required, the IFF system transmits IFF interrogation pulses to the unidentified object. If the object is a friendly aircraft with IFF equipment, IFF response pulses are transmitted by the aircraft and received by the IFF system. The IFF response pulses are converted into IFF video for display on the cathode-ray tube indicators. Tactical control data from an Army Air Defense Command Post (AADCP) is supplied through either the fire unit integration facility (FUIF) or the battery terminal equipment (BTE) to the tactical control system. If the tactical control data received by the tactical control system from the AADCP or IFF indicates that the unidentified object is an enemy aircraft or missile, the object is designated as a target. Designated target position data, derived from selected acquisition radar display, is supplied to the target tracking (TTR) system. The designated target position data aids the target tracking radar operators in acquiring the target. The TTR system transmits a beam of FR energy to the designated target and receives the reflected RF energy. The reflected RF energy enables the TTR system to track the target and to provide continuous target position data to the computer system. 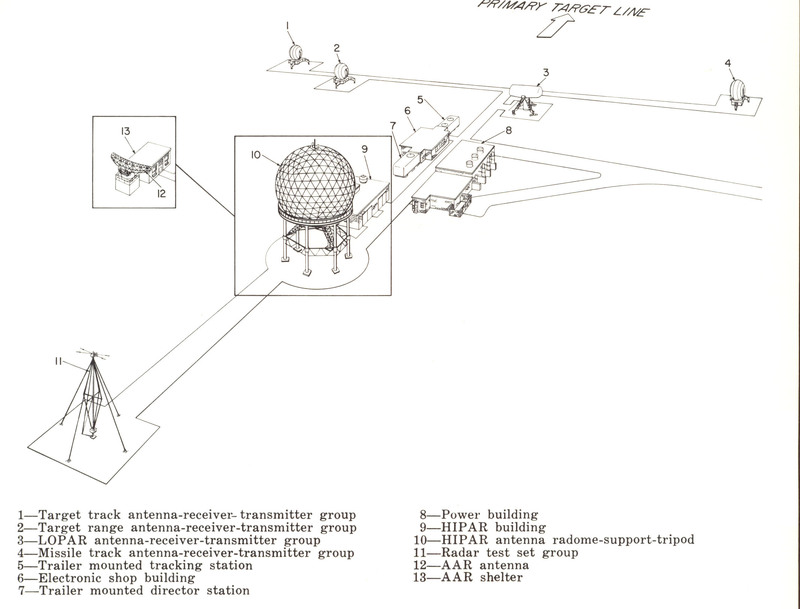 The TTR system provides antenna position data to the target ranging radar (TRR) system. The TRR system, slaved to the TTR system also tracks the target by transmitting RF energy and receiving the RF energy reflected from the target. The TRR system supplies range video to the TTR system. The continuous target position data supplied to the computer system consists of azimuth and elevation data from the TTR system and range data from either the TTR or TRR system. The use of two radar systems for range tracking provides advantages in combating enemy electronic countermeasures (ECM). Tactical control data, such as missile, mission, and warhead designation and the fire command, is supplied to the launching control group from the tactical control system. When a target is being tracked, the computer system continuously calculates a predicted intercept point, determined from the target position data supplied by the TTR system. The computer system sends gyro azimuth preset data through the launching control group to the designated missile on a launcher. The gyro azimuth preset data orients a roll amount gyro into the missile. The gyro provides a stable reference that enables the missile to roll automatically to a predetermined attitude, after launch, relative to the predicted intercept point. 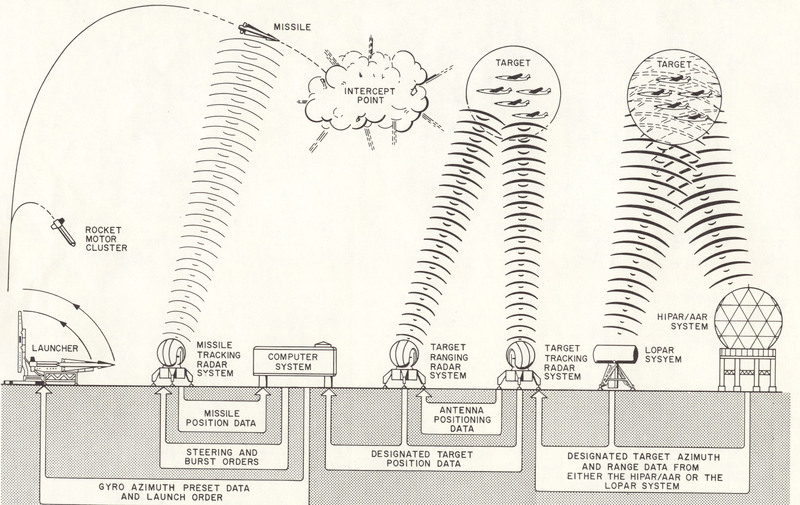 When the target is being tracked, the computer system sends steering orders to the missile tracking radar (MTR) system. The MTR system converts the steering orders to guidance commands, consisting of coded pulses of RF energy, that are transmitted to the designated missile on a launcher. A transponder in the missile responds to the guidance commands by transmitting RF response pulses. The transmitted missile response pulses enable the MTR system to "lock on" the designated missile prior to launch and to track the missile after launch. The fire command is generated manually and sent from the tactical control system to the launching control group as tactical control data, and then to the missile on the launcher as the launch order. After the missile is launched and has separated from the rocket motor cluster, the missile rolls to the attitude determined before launch by the setting of the roll amount gyro and heads in the direction of the predicted intercept point. The computer system, receiving continuous target position data from the TTR system and continuous missile position data from the MTR system, determines that maneuvers are necessary to cause the missile to intercept the target and sends the appropriate steering orders to the MTR system. The MTR system converts the steering orders to guidance commands that are transmitted to the missile. The missile guidance set converts the guidance commands into control surface deflections that produce the required missile maneuvers. The missile continues to transmit response pulses which enable the MTR system to track the missile and supply continuous missile position data to the computer system. When the missile is within lethal range of the target, the computer system sends a burst order to the MTR system. The MTR system transmits a burst command that detonates the missile's warhead.